After having lots of fun at the first K-Pop Dance Cover Festival in Vienna on June 1st 2013, what could fans of K-Pop make getting excited again? Right! Having the winners of the event back in Vienna and let them teach fans personally! In the last week of August, on the 29th & 30th, three members of the KPOP ALLSTAR team returned to Vienna to have their very own workshop to teach others how to bust some moves! On August 29th 2013 Gwen-Doly and Danny teached for 1,5 hours to Kpop songs with their own choreography. It was very interesting and fun to be thought for the participants by two persons who have previously held a couple of workshops in Paris already. Gwen-Doly made sure to represent GI with their song „Beattles“ – a very powerful hip-hop choreography. As for Danny who tought a more slow and smooth choreography to Zion T’s „Click Me“. The latter made everyone having an R’n’B-ish feeling. Tina, the last among the three instructors, taught her very first workshop on August 30th. She was the only one who didn’t work on a K-Pop song but rather chose „Love Me“ by Chris Brown feat. Nicki Minaj. Tina’s workshop was welcomed by a lot of young dancers who enjoyed the whole dance session. She was also on the same wave length as her students which was appreciated amongst all participants. Speed as well as her friendly way of instructing showed that she already has some potential for teaching in the future. At the very end of their workshop, all of them taught together and show the participants „History“ by EXO. This was also their winning perfomance at the K-Pop Dance Cover Festival back in June. The students apparently enjoyed the whole workshop – they sweated a lot but also had a lot of fun at the same time as they fully enjoyed the jokes and movements from KPOP ALLSTAR. This was only the beginning of their follow-up journeys to Vienna because they will surely return to hold another workshop… So stay tuned and keep reading about their upcoming news on Kpopeurope.eu! 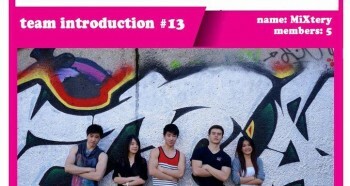 [en][de] K-Pop Dance Festival Vienna – Team Introduction #15: Z.A.M.S.